Sewage cleanup is a dirty job, and not only because of the obvious mess and odor. The real problem is the unseen hazard – biological and chemical contaminants left behind after the visible damage and the smell have been washed away. Whether flood water or a septic malfunction has unleashed the effects of sewer damage on your home or place of business, Archer Restoration Services is the choice for prompt, professional sewer cleanup in the Atlanta area. Because we know sewage cleanup is a time-sensitive project, Archer is open for business 24 hours a day, 365 days a year. We can make it out to most jobs in less than an hour, whether flood water causes sewer damage in the middle of the night, or your septic tank overflows during a major holiday or on the weekend. Don’t forget, sewage cleanup is not complete until every potential health risk has been dealt with. If a sewage backup cleanup job takes our technicians into your flooded basement, rest assured the project won’t be considered finished until every nook and cranny is safely and completely decontaminated. And if the sewer damage leads to structural damage elsewhere in your home or place of business, Archer’s turnkey service means our experienced, courteous technicians can handle every aspect of restoration without calling in another contractor. 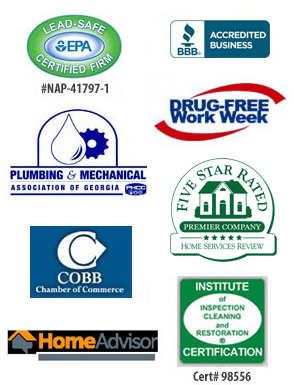 Archer is fully licensed, bonded and insured, and we carry an A-plus rating with the Better Business Bureau. We also offer direct insurance billing, limiting the burden for you, the client. Contact Archer Restoration Services for sewage cleanup in Woodstock, Norcross, Lawrenceville, Canton, Stone Mountain, Sandy Springs or anywhere else in the Metro Atlanta area. “I wanted to reach out to tell you how impressed I am with your employee, Jeremy. We just started working together on a project for my condo. We set up a plan on the most effective way to work together and he listened to my challenges and adapted to my needs. I recently had a sewage backup just after Christmas and used Archer both with your disaster team and now your repairs team. It was a very difficult time as I was called out of town to care for a sick parent and hard to reach while in the hospital. From the front desk staff, project team to finance, everyone worked with me and kept me updated. To top it off, when coming to the site of my rental property, he assisted my tenant in changing her flat tire! He went out of his way to do a nice thing without being prompted or take any expression of gratitude except a “thank you”! Very much appreciated! Please pass along to your management team” – Martha Q.